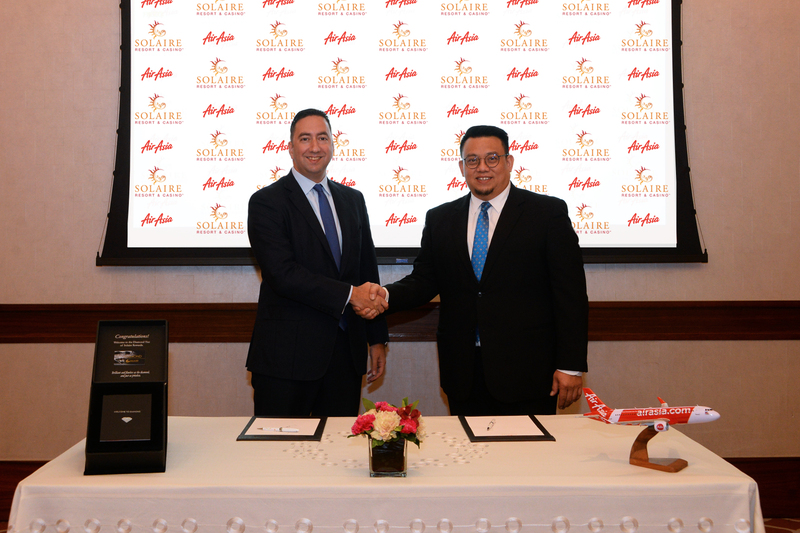 Solaire Resort & Casino welcomes AirAsia to the Solaire Rewards Program, to make the dream of traveling within reach. Traveling is a way to enrich the mind and understand the numerous cultures of the world. For many, checking countries off from their bucket list is a life-long dream. Fortunately, the developments in the travel and tourism industry have paved the way for loyalty programs to reward its members with travel miles in every purchase made. Each Solaire Rewards Program cardholder starts at the Silver Tier and moves up to Gold, Platinum, Emerald, Ruby and finally the Diamond upon earning the corresponding Status Points needed. Loyal Solaire Rewards members will be closer to their ideal destination when they reap travel rewards from the Status Points that they earn. One Solaire Rewards Status Point will be equivalent to one AirAsia BIG Point, making it easier to track and redeem that much-coveted flight upon linking the AirAsia BIG Member ID to Solaire Rewards. Bloomberry Resorts Corporation (PSE: BLOOM) is a public company listed on the Philippine Stock Exchange that develops destination resorts featuring premium accommodations, gaming and entertainment, and world-class restaurants and other amenities. The company’s flagship property, Solaire Resort & Casino, is an integrated destination resort on an 8.3-hectare site in Manila, Philippines and the first to open in the government-sponsored (Philippine Amusement and Gaming Corporation) economic development zone known as Entertainment City. Philippine-based Solaire Resort and Casino currently operates two distinctive towers, the Bay Tower and the Sky Tower with 800 opulent rooms, suites and bayside villas. Solaire Resort and Casino the first premier integrated destination resort to open in the Entertainment City with luxury facilities and personalized services. Solaire has 15 extensive dining options, bars, lounges and entertainment venues. A total of 18,500 square meters of impressive gaming facilities. 1,823 seat State-of-the-art lyric theatre. Other facilities are an outdoor swimming pool with cabañas and Jacuzzi, Spa and fitness center. The Sky Range Shooting Club an indoor shooting range for gun enthusiasts and shooting aficionados. 41 retail shops, 2,920 square meters meeting facilities, a grand ballroom, along with full banquet and catering facilities. AirAsia BIG Loyalty was established in November 2011 and is owned and operated by Think BIG Digital Sdn Bhd, a subsidiary of AirAsia Bhd in collaboration with Aimia Inc. As the loyalty program for AirAsia, AirAsia BIG Loyalty enables its members to enjoy the lowest flight fares across AirAsia’s extensive network. More than 18 million AirAsia BIG Loyalty Members can earn AirAsia BIG Points on AirAsia flights to over 130 destinations across Asia, Australia and New Zealand and the Middle East, participating hotels as well as retail, e-commerce, travel and lifestyle partners within the region. The loyalty program makes all seats redeemable by utilizing AirAsia BIG Points. Other member-exclusive privileges include 24-hour priority booking for selected AirAsia sales. AirAsia BIG Loyalty was named the Loyalty Programme of the Year in 2016 and won gold for Best Regional Loyalty Marketing Campaign, Best Use of Direct Marketing, and Best Use of Social at The Loyalty & Engagement Awards 2016. In 2018, it received the Best Use of Technology Award at the 10th Annual Loyalty Conference and Awards. It also took home a gold for Best Loyalty Programme – Travel/Hospitality at Loyalty & Engagement Awards 2018. The AirAsia BIG Loyalty app is available for download from the Apple App Store and Google Play Store. For more information on the mobile app plus other updates, log on to airasiabig.com or follow AirAsia BIG on Facebook, Twitter, and Instagram.